While you are ready for a travel plan there are a number of things in your mind. From flight bookings, hotel reservations, and a list of other such activities. Google Keep can be a great tool with few powerful features you shouldn’t miss while planning your next trip. Google Keep is a useful tool that makes your trip easy with its impressive features you'll need when you are on the trip alone or with a group. Did you ever try to organize a trip for the group of people? This can really be a challenging task. Each person wants to offer ideas, voice their opinions, and stay up to date with the plans. This is when Google Keep can save your time and efforts. Whether you are organizing your trip with your family or just a few of your friends, take advantage of Google Keep’s collaboration feature. This lets everyone stay in touch with the plans and keeps all travel items in one spot. For instance, you can create notes with full details for each part of the trip. You might have notes for the hotel accommodations, flight information, weather forecast, and more. Each note can include text, links, images, and lists. Then add collaborators to each one and your group will have access to it all. Just click the collaborator icon on the note and enter your friend or family member’s email address in the pop-up box. 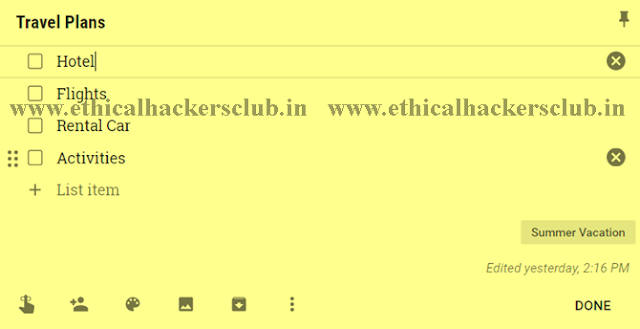 They will receive an email with the title of the note and a link to open it in Google Keep. You can add more than one collaborator, making it perfect for planning with a group. Google Keep helps in reducing the stress of planning a trip for more than one person with its valuable collaboration feature. Must Read: How to Hack Android. Google Keep includes a checklist feature which can be used to keep your plans in order. And you will likely need more than one list for your trip. First, you can create a list of all travel plans that need to be made. You might include booking a hotel, comparing flights, arranging a rental car, and mapping out activities. Then as you complete each part of the plan, just mark it off the list. Must Read: Programs For Schols. Next, you can plan your packing with the Google Keep checklist feature. Add your clothes, shoes, accessories, and toiletries in just minutes. If you like to plan your packing by day, you can create a list for each day during your trip to ensure that you have enough, and not too many, items. Must Read: Cyber Intelligent Schools. You can share lists with the others. So it is beneficial if each person takes care of an item on the list. 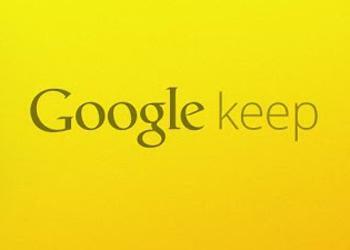 You can also use Google Keep on your mobile phone. This makes marking off list items convenient no matter where you are when you complete them. Google Keep has a variety of options for organizing your travel plan notes. Use color codes to see similar notes at a glance. You can color all notes with blue for one trip or use a different color for each stage of the trip. Create and add labels for fast access to relevant notes. You can create a label for “Winter Break” and then another for “Road Trip”. Drag and drop notes to rearrange them and display them in either grid or list view. Pin notes to keep the most important items at the top. Add a drawing for instructions, hand-written notes, or just some fun. Get Ready to Plan Your Next Trip With Google Keep And Let Us Know in Comments.